Surviving a plane crash is the kind of event that can give someone a unique perspective. That was certainly the case for Don Carlos Pellas and Vivian Pellas, leading to one of the more unusual stories in the rich and colorful history of golf course development. In 1989 the couple was among just nine survivors of a plane crash in the mountains of Honduras that claimed 149 lives. 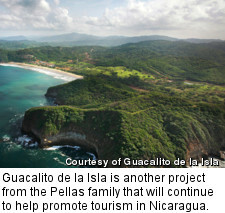 The life-changing event sparked a lifetime of philanthropy and refocused their energy on projects that would be beneficial to their beloved Nicaragua and help promote tourism. One of these projects is Guacalito de la Isla, a 1,670-acre low-density private beach community that includes the luxury Mukul Luxury Resort and Spa and the Guacalito Golf Course -- all located along sprawling Manzanillo Beach on the country's beautiful Pacific Coast. The Pellas' discovered this gorgeous place a decade ago while sport fishing -- a sport for which Nicaragua is known around the world. Don Carlos was so moved by the beauty of the land that it haunted him until he finally bought it. Now it is home to the country's first 18-hole beachfront golf course -- and it's a beauty. Don Carlos wanted to preserve the unique environment of the dry rainforest on Nicaragua's Pacific Coast, but golf course designer after designer wanted to reshape the land -- until he met David McLay Kidd. 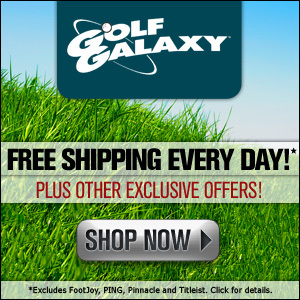 Kidd preferred to "discover" a golf course in the natural setting. He is the architect responsible for the biggest sea change in modern golf history, when his minimalist Bandon Dunes in Oregon rolled back the clock on golf course design more than a century and ushered in the neoclassical era. Kidd has continued this winning streak of letting dramatic landforms speak for themselves with the Castle Course at St. Andrews and Machrihanish Dunes, both in Scotland. Kidd and Don Carlos collaborated to create a course at Guacalito de la Isla that rolls effortlessly across lush jungle and to the sea, yet is devoted to the conservation and preservation of this stunning landscape. Not one native tree was chopped down in the three years of construction. 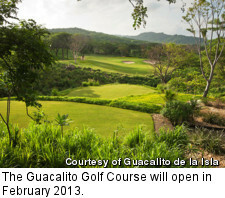 The course is scheduled to open Feb. 1, 2013. 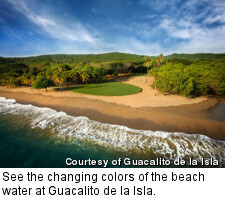 While the course is stunning, there is more to the Guacalito de la Isla than just golf. The beaches are gorgeous, with excellent surfing right off the 18th green, and the jungle/rainforest setting is emphasized throughout. 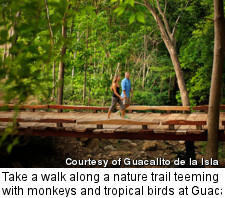 There is a nature trail (more than seven miles long) teeming with monkeys and tropical birds. There is whale watching, scuba diving and, of course, big-game sport fishing. There is a nature "ranger" staff to lead outdoor activities and protect the native sea turtles, which can be seen during nesting season, and there is a full-service beach club with motorized and non-motorized watersports. 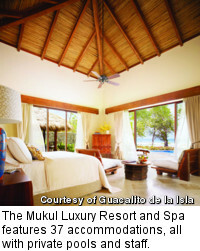 The Mukul Luxury Resort and Spa is high-end, a member of Small Luxury Hotels of the World. It features 37 accommodations -- one- and two-bedroom villas, all with ocean views, private pools and staff. 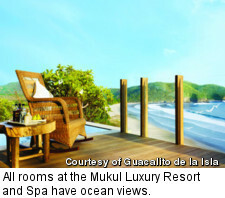 The resort includes dining and a full-service spa. Guacalito de la Isla has a variety of vacation property offerings, including lots for custom homes, duplexes and condominiums, all of which will officially be put on sale this year. The low-density development has an average of less than one residence per two-and-a-half acres. Many homes sit along the coast with ocean views, some even bordering the sand of Playa Manzanillo, while others are along the golf course or on inland hills amid lush vegetation. There are three different "neighborhoods" at Guacalito de la Isla. La Reserva is perched high on a forested hillside, an enclave of private estates offering some of the most breathtaking ocean views in Nicaragua. It will be home to custom residences for 49 families, with lots from $265,000. The Ocean View Villas at Verdamar are adjacent to La Reserva, composed of just 28 villas, all ocean view, with immediate access to both the golf course and beach club. There are two villa options: four bedrooms/four baths or five bedrooms/five baths, starting at $725,000. Las Terrazas, on slopes overlooking Manzanillo Beach, is composed of turnkey condominiums designed to capitalize on views and offers beautiful outdoor living spaces. Each unit has three bedrooms/three baths, spacious balconies and al-fresco lounging and dining areas. Some feature plunge pools and rooftop terraces. All penthouses can have an optional fourth bedroom on the rooftop terrace. All units feature a choice of maid/nanny quarters or an enlarged pantry with owner lock-off storage, starting at $385,000. Whether you choose to visit as a resort guest or buy a property, from the beach club to the resort restaurant to the 19th hole, there is no shortage of aged Flor de Cana rums at Guacalito de la Isla.